Elisabeth's ETLyoga retreats always include nature. In 2007, Elisabeth founded MOAB YOGA on the ROCKS. MOAB YOGA on the ROCKS is dedicated to delivering an enriching, refreshing, and rejuvenating backpacking and outdoor yoga retreat. The combination of qualified and experienced instructors and guides, and an intimate group of only ﬁve people, gives our guests an authentic experience like none other. ETLyoga retreats strive to achieve the same level of adventure and intimacy. Retreat sizes are limited, while locations are guaranteed to be unique and unforgettable. To stay informed about upcoming retreats, please sign up for ETLyoga’s e-mail list. As women we are taught and shown how to love and not love our bodies. Even more heartbreaking we are taught that we are only our bodies. The relationship with womanhood and body for many women shows up in: disordered eating, negative self-talk and the never-ending search for self-love and compassion towards bodies we have severed a relationship with. Negotiating what I call body-talk is a kinder way, learning (not forcing, shaming or guilting) your way to a new relationship with your body through nature, guided meditation, yoga, journaling, art, mindfulness practices, therapeutic exploration and story sharing. This intimate retreat of 6 women will focus on a new connection and way to communicate with the body. ETLyoga is dedicated to delivering an enriching, refreshing and rejuvenating outdoor yoga retreat. Expect that you will hike, practice and meditate daily. Our Women specific retreats will have daily hikes consisting of 3-5 miles hikes round trip. Our yoga practices will range anywhere from, 75-120 minutes depending on the day's activities. Meditation will be two 30-minute sessions a day; one in the morning and one in the evening. 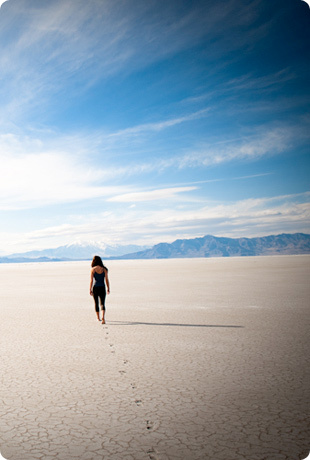 Meditation is not just a seated practice, but may include meditation walks. Journaling, story sharing, therapeutic exploration, art, mindfulness activities and practices. Accommodations: Talking Mountain Yurts are located in the La Sal Mountains. Just outside of Moab, Utah giant volcanic cinder cones look over red rock country. 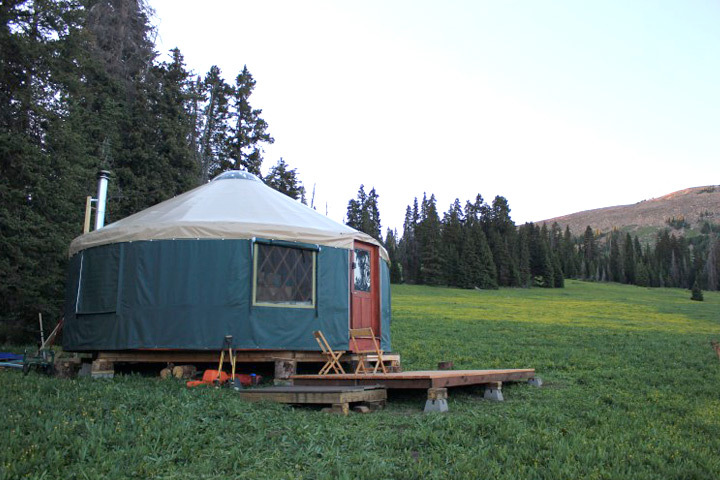 Nestled along aspen and pine, overlooking a high alpine meadow is the Geyser Pass Yurt. Geyser Pass Yurt is outfitted with 2 bunks, each sleeping one on top and two on bottom (the bottom bunks have two separate mattresses that will be made individually) outfitted with full linens. We do suggest you bring a sleeping bad if you tend to get cold at night though blankets will be provided. There is an outhouse onsite, however, no showers. This is camping with a few more creature comforts. *Please note: All cooking is communal. While food will be provided for cooking and menu will be planned--because this is community and relationship building experience each participant will be assigned cooking assignments upon arrival (flexible and able to change if necessary). What will my retreat look like? 3:00 Meet and Greet. Getting to know you! *Please note that due to the ebb and flow of life this itinerary may change. This is to give you an idea of what your retreat will look like. You will be mailed an information packet a few weeks before your retreat with more in depth information. **Please note a deposit is required to hold your spot. Your deposit is non-refundable. Your payment will be due in Full one month before your retreat. Payment minus deposits will be refunded in full (less a processing fee) if you cancel 30 or more days prior to your arrival date. If you cancel between 29 days and 15 days in advance, a nonrefundable credit (less a processing fee and deposit) will be held for one year from the date of issue. If you cancel 14 to 1 day in advance no credit or refund is available. If you cancel less than 24 hours in advance or on the workshop's arrival day, do not show up, or if you leave an event early for any reason no refund or credit is available. However we do understand emergency's can come up, these cases will be handled individually as ETLyoga sees fit. ETLyoga reserves the right to cancel any program at any time. In this event, you will be given a complete refund. However we are not liable for any other costs incurred (travel, time off work, etc..) ETLyoga reserves the right change the location and/or venue.